Amazing! The best team. Stem was a key piece for our greatest night. Anabelle make all the process easier and they knew from the very beginning what we were looking for. They are such incredibly talented and creative people who love what they do and it's reflected in every detail. Their photos speak by themselves. Their talent is incredible and their imagination doesn't have limits. I enjoy the whole process. Miss them already. I am so happy we went with Stem Events. Anabelle took my vision and made it more beautiful than I could have imagined and all within our budget. My bouquet was breathtaking. She was a delight to work with, super creative, responsive and professional. Highly recommend! Creativity, Flexibility, and Totally Awestruck! We came to STEM events with a clear idea of what we wanted, a focus on Geometrics with a color pattern of gold, white, and black. And, we also had a very clear budget. We had countless weeks and meetings looking for a vendor that would fit our vision and our budget. When we met the STEM team, we had instant chemistry, and their desire to make our dream come true with flexibility, creativity, and adjusting to our budget made us feel comfortable with our decision. The result was so much more than what we envisioned, our venue looked dreamy, elegant, and our guests where awestruck. We cannot have made a better decision than working with STEM! STEM Events did an AMAZING job! 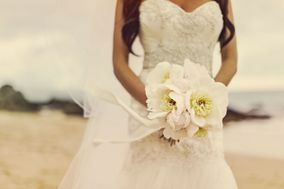 I am in love with the flowers, I can't stop seeing the wedding pictures. I am so in love with everything that Anabelle did! I present her my ideas and she made everything come to life! I highly recommend STEM Events, it was a pleasure work with them. Working with STEM was wonderful. They really listened to what I wanted, it was reasonably priced and they communicated quickly. I ended up with a beautiful bouquet and as a special touch, they used an antique ribbon that belonged to the owner's aunt! Overall, it was a great experience. Anabelle and her staff did an amazing job with the wedding decoration. The decoration was exactly what we envisioned our dream wedding to look like. We weren't happy with the first decoration sample, and Anabelle was defensive about it since it was what we had initially discussed. After some back and forth with Anabelle we sketched out a decoration plan we were happy with, but we did not get to see a sample prior to the wedding. The decoration ended up looking way better than what we had imagined based on what we discussed with Anabelle. Anabelle's attention to detail was impressive! At first we thought we were paying too much for decoration, but after seeing the final result... it was worth every penny! We highly recommend STEM's services to anyone that wants breathtaking decoration! 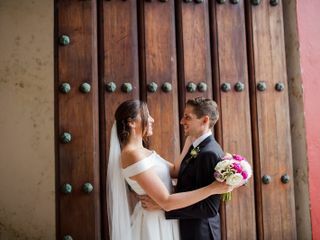 Gracias por hacer mi sueño realidad, aún recuerdo con mucho entusiasmo el momento que me tomé para asimilar el espacio tan hermoso que habían creado para celebrar nuestra unión matrimonial. Cada mesa, cada detalle fue simplemente espectacular. You guys went above and beyond to make my garden happen and I will be forever thankful. Durante esta aventura fueron muchos los cambios, gracias por siempre adaptarse a ellos y decir que si a cada locura. No hay duda de porqué son el mejor equipo, no tan solo me regalaron un gran día, me gane a una amiga, la reina de las peonies. STEM events did an amazing job! When I first started planning my wedding I knew I wanted something beachy, yet elegant, but could not visualize or describe exactly what that would look like. My ideas were pretty scattered and unclear. Anabelle was super receptive to my few likes, dislikes, and pinterest pins and did an extraordinary job putting together exactly what I wanted with the little guidance I provided her. Anabelle and Francisco were amazing to work with. They took care of all the furniture rentals, flowers and design of both our ceremony and reception decor. She was easy to work with, timely and prompt in responding to any questions or emails that I had. Most importantly, she was able to execute the wedding of our dreams exactly how I had pictured it in my mind, even though it was difficult to express exactly what I wanted during the planning process. They do beautiful and unique weddings that are classy and elegant. I would put my full confidence in their talent and abilities a million times over. The first time I called Anabelle was because I saw one of her weddings on her website in the same place I wanted to make mine and I LOVED that decoration I even had dreams with it. Immediately when we started talking, we made an amazing click, we agreed on so many things, it was like meant to be. I loved how genuine she sounded, and by just hearing her talk, I noticed how much she enjoys doing her job. Once we met with her, my husband and I thought it was a non-brainer to choose Stem for the decoration of our wedding. In such a complex world it is hard to find genuine, responsible, creative and dedicated people. Stem has it all and more. Since we hired them literally they were the only vendor who I was 100% sure that I did not have to worry about ANYTHING. I just told her what I wanted (and I'm pretty stubborn) and she created something even better than I could have imagined. After three months of our wedding I can say that I won a friend. We love you Anabelle & Stem Events crew! Anabelle and her team were excellent to work with. She had the best flowers at the wedding. Her eye for decor is exceptional. She totally made the wedding look like a Pinterest wedding!! I'm so glad we were able to meet Annabelle per chance that she had a wedding in Vieques the same week we were there to scope out wedding details. I was not only able to speak to her face to face but also see some of her talent first hand. I could see that she had a definite eye for floral style. Stem Events also has a website to look over to see the beautiful work that they have done. Even though Hurricane Maria postponed our wedding 6 months, Annabelle was flexible to accommodate all of our changes. 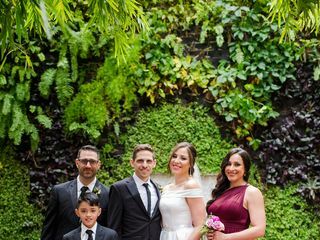 With just a few emails sent back and forth with letting her know what I was looking for and after having a little bit of destination wedding jitters, I had confidence that this team would do a great job. And boy did they not only do a great job, Annabelle and her team did a fabulous job! The protea was the one flower I wanted to be sure was incorporated into everything. She did such a beautiful job with how she put it into everything we had and grouped it with the perfect accents. From the simple yet wonderful centerpieces to my daughter's halo to boutonnieres to my mother's wrist corsage. Everything was on point. But the piece de resistance was my bouquet. It was THE most gorgeous bouquet I had ever seen. And it was absolutely perfect for our wedding. Annabelle and her team not only do floral magic but are very easy to work with. I would definitely recommend Stem Events and wouldn't hesitate to use them again. Worth every penny. Decor was something I was very hesitant about my wedding. I contacted and visited like ~5 coordinators/decorators or more. Either I didn’t felt comfortable with the way they interpreted my vision or they were out of my budget (they literally tell you I dont do wedding on that budget). Anabelle gave me options from full wedding coordination to only been my decorator. There was something about her that made me feel comfortable and after looking for more economic options I decided that StemEvents was going to be my wed decorators. We talk a lot during the contract signing process. She even did a couple of wed that incorporated some of my request. A couple weeks before the wedding we talk about my final visions and flowers. That was it! At that point, I just let her do her job which based on her social media posts she does very very well. And she did!!! Everything was they way I imagined! Flowers, metal details, candles, peonies (thank you Anabelle)! She did a great job and the best, she was able to give us a beautiful simple wedding like we wanted!!!!! 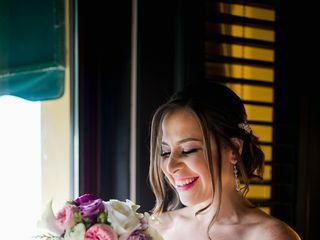 I met Anabelle through my wedding planner, Anne Marie Kleis, and immediately felt connected to her and her style. I had a very clear idea of what I wanted for my wedding, and even though Anabelle suggested a few things which I ended up saying yes to and loved, she respected and executed my ideas to perfection. I am so glad I ended up choosing Anabelle and her team for the decoration of my wedding... everything was so unique and tailor-made to our taste! Cannot day enough wonderful things about Annabelle at STEM. She took on our wedding that was only a month away and did an incredible job, so easy to work with. She made me the most perfect birds of Paradise bouquet that was better than anything I could have asked for! I was a very very happy bride! This review is long overdue and I cannot brag enough about Anabelle's work! She is just AMAZING at what she does, and turned my vision into a reality. I was stunned when I walked into the reception, it was exactly what I wanted. All of my guests were impressed with the flower arrangements and decorations, everything was just perfect. Working with Anabelle was very easy, she is friendly, responsive, and accommodating. She made last minute boutonnieres, at no additional cost, when the wedding planner asked her to, added more flower arrangements, at no additional cost, when I decided to have one long imperial table instead round tables, surprised me with a beautiful candelabra on the table, even though it was not on the budget. I could go on and on about how accommodating she was. Truly, Anabelle, you are the best! I met STEM through Facebook and fell in love right away. I called Anabelle and felt like I knew her because of her outgoing personality. She understood exactly what we wanted the very first time I described what I was looking for. Right then I knew she was all I was looking for. Since then, Anabelle made sure she was gathering all the perfect pieces to achieve our vision; she even contacted me when buying my bouquet ribbon! All the flowers she ordered were beautiful and combined perfectly with each other and with our theme. The day of the wedding Anabelle and her staff arrived early and everything was in perfect place when I arrived to get dressed. The outcome was perfect and everything was beautifully done. I really recommend STEM and if responsibility, originality, accessibility and fun is what you're looking for they're definitely the way to go. Working with Stem was great. They not only helped me with the flowers, but actually gave my solid advice on almost every area of the planning. 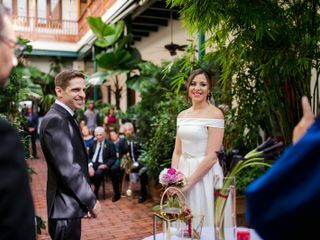 My husband is Puerto Rican, so we go to Puerto Rico quite often and it made the decision of having the wedding there pretty easy. Even though I am familiar with PR, I don't know it that well and there will always be logistical things that I just won't know. I found Stem when I was looking at another wedding that was done in Vieques. I called Anabelle and she was able to provide me with SO much information. Even after the hurricane and we thought we might have to relocate our wedding from Vieques to the main island, she helped provide us with venue options. They go above and beyond. The wedding looked BEAUTIFUL. Anabelle is a strong character, but she always had my best interest at heart and if there was something that was super important to me, she made sure to make it happen. Highly recommend!! Great experience. Highly reccomended. They went "above and beyond" with the decoration. Stem Events was the absolute perfect choice for our wedding decoration. I came about Anabelle from her signature events in Vieques. Although I was dreaming of an outdoor garden wedding, I wanted the comforts of an indoor venue. Inspired by what had been my grandma's love and passion for flowers, I trusted Anabelle to create an enchanted garden. Since I wanted lots of color, she proposed color blocking tables. The result was the most beautifully crafted indoor secret garden. All the flowers were carefully selected and perfectly placed, with the natural sophistication, elegant and organic taste that characterizes Anabelle. A true homage to spring. 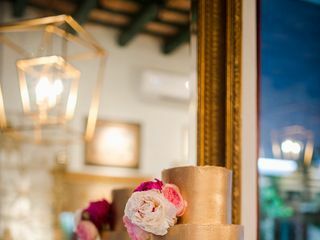 From our wedding ceremony, to the place card table, to the wedding cake table and everything in the venue, no single detail escaped Anabelle. The hanging lights from the ceiling flowed naturally as another work of art of the Museum where we celebrated our wedding. As the sun set into the night , the perfectly selected and placed lights gave our wedding an incredible look. Stem Events is the way to go if you want a natural artist with exquisite taste decorating your wedding. She will take your idea and transform it into a perfect dream. Not to mention that she is great to work with, she will share her ideas with you and make you feel her passion for flowers ! Thank you Anabelle ! We will be forever grateful !